Yesterday, I participated in a faculty panel as part of my university’s recruiting day, for high school students, and their parents, interested in attending our school–a panel in which a few of us answered questions about what we wish we knew then that we know now, what our favorite courses were to teach, etc. Message sent? Faculty are approachable. Not a bad one to transmit. During the two sessions, those in attendance were also told of the many activities outside of class time that students can become involved in–the days of student clubs (or what scholars of antiquity might call voluntary associations?) are long over, as anyone paying attention to current trends in higher education (at least in the US) well knows, for now the institution itself immerses students in a host of authorized extracurricular activities aimed at further integrating incoming students, who have more than likely left their home environment for the first time in their lives, into a rich experience that will, hopefully, ensure they return next year (i.e., retention) and graduate on time (i.e., graduation rates, like retention rates, are now crucial measures of the modern university’s effectiveness and productivity). Come to think of it, ancient voluntary associations might have been just as authorized by the state as these new ones are for our students. As one rationale for the blossoming of these many extracurricular activities (from Freshman Learning Communities to working on independent research with a professor–some more and some less woven into a direct relationship with the student’s curriculum) the students and their parents were told that, after all, they’d only be spending 20% of their time at university doing school work. What is to be done with the other 80%? Good question. So I did a little math. Given that there are 24 hours in a day, and 7 days in a week, then that means that 20% of 168 weekly hours = 33.6 hours spent on school work. 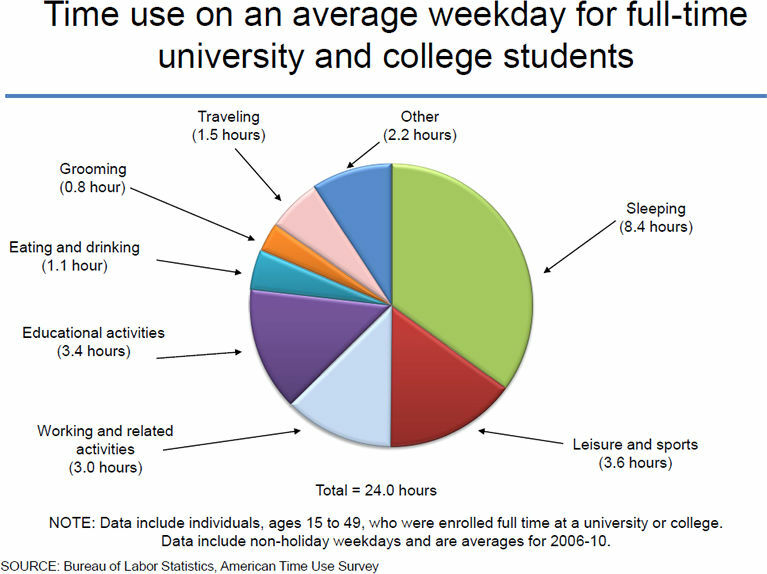 On average, a student enrolled in 5 courses per semester, that each meet for three hours per week (i.e., earning 15 credit hours per semester), will therefore spend 15 hours per week in class and thus 18.6 hours per week preparing for class, doing homework, working on assignments due later in the semester, or studying for a test. To rephrase: for every hour actually in a classroom the 20%’er will spend 1.24 hours doing all of these other activities outside of the classroom. A colleague tells me that he always thought the standard was 2:1–for every hour spent in class the student ought to spend at least two outside class preparing for the course. It seems that grade inflation and tuition hikes correlate with work deflation? I was somewhat shocked to hear this statistic presented to future first year students and their parents–while descriptively accurate, perhaps, it strikes me as sending the entirely wrong message to students; for I would hope that my 100-level students would, minimally, spend at least an hour preparing for each of my classes, let alone the time they need to spend after class going over their notes, cross-referencing class notes with the readings they did in advance of class and the notes they took on those readings, all meant to synthesize the recently new material prior to the next day’s new batch of information. I’ve taught the material in that course once or twice or…, well, you get the picture, and I still spend more than that preparing each day’s lecture. And I know the material! As for my upper-level students? I presume that they are doing even more work outside class, to shine while in it. But if this 20% rule is what students, parents, and thus the general public, thinks university-level work requires of them then no wonder many think that people who work in universities (or teachers in general) are getting a free ride–summers off and all that. So after my math I did a little surfing on the web and found the following pie chart, produced by the US Bureau of Labor Statistics. Leaving aside the curious statistic that students spend almost as much time grooming each day as they do eating, and not questioning which drinking lands under “Eating and Drinking” as opposed to the drinking that likely falls under “Leisure and Sports,” according to this 2006-10 data, the situation is even worse than yesterday’s session led me to believe. For now only 14% of the day is spent on anything to do with school. My guess is that this data would have looked rather different a generation or two ago; and my hunch is that trends in data like this have something to do with what is portrayed by government as the national crisis in US higher education concerning declining math and science test scores–a decline that drove the federal government’s stress on national standardized testing (e.g., the No Child Left Behind program, implemented under President George W. Bush), a program that, soon after, trickled up to the university where a professor’s credentialed expertise and experience is no longer sufficient to earn him or her the confidence of the administration or state legislators. Assessment, driven by outside credentialing bodies, has replaced shared governance as the key word of the modern university. So how do you spend your time? And is part of the problem in thinking about time as something you spend? This entry was posted in Faculty Blog, Relevance of Humanities and tagged assessment, governance, higher education, standardized tests priorities, time spent studying by Russell McCutcheon. Bookmark the permalink. This is the second instance within the past week this issue of time being metaphorically represented as currency has occurred. When shooting the department video, I was joking around and said, “Time is money, people.” It was a bit of a nerdy/scholarly reference to, _Metaphors We Live By_ by Lakoff/Johnson, and I think you picked up on that. Also of interest to me is this category of _leisure_. I’m not saying that this is the norm, but I venture to guess that there are others on campus who can relate to an ambiguous distinction between what we do here as students and what we consider leisure. I actually enjoy my studies for the most part. For instance, at the moment I’m doing a class with Dr. Merinda Simmons on “African Diaspora” and individual research with Dr. Tim Murphy on the intersection of structuralism, post-modernism, and Marxism. Although it might make me appear more ascetic or disciplined to refer to all the time I spend on these two classes within the “educational activities” it would just as easily, in my case, go within the leisure category. What?! Schoolwork as leisure?!!! Some of the most enjoyable memories I’ve held from experience since this semester started has been reading articles by James Clifford on “African Diaspora” and Nicos Poulantzas and Roland Barthes on class, ideology, and the reproduction of social identities. If you enjoy what you do and if you would still study the things you are studying in an undergraduate program even if it didn’t “pay” via the “intellectual currency” given by the academy’s recognition or by the commodity of money, is it still school _work_? Surely this isn’t educational. It’s too fun, right?